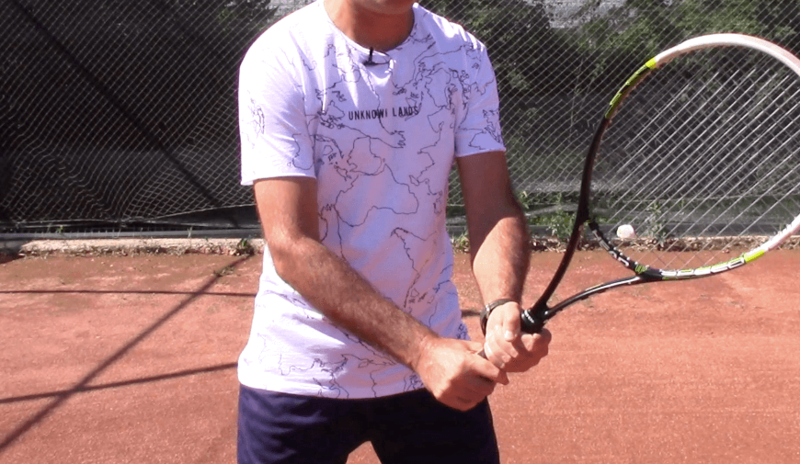 While I was practicing with one of my tennis friends, he showed his frustration for not being able to control his racquet – due to the humid air his grips would become easily slippery while playing. – Consume salty foods (stay away from junk ones like french fries or chips). I once saw a friend of mine eating from a bag of pretzels before a tennis match; he said it helped him to not sweat too much during the match. I would not recommend that and never tried it. Find some other sources of foods that contain sodium like vegetables or chicken broth. – Get a fresh new grip or over-grip. – Use special cream that keeps hands dry (you can find them on the internet or local tennis shop). – Blow into the palms after every point you play (my favourite one). – Wipe the palms against the court’s windscreen (your call 😉 – risking to get your hands dirty but it actually works very well in drying the palm (I tried it many times). – Use a dry towel that you have placed somewhere close to where you are (put it on a chair next to the back fence just in case there is no other support for the towel). Use your judgement when applying the before-mentioned tips. Slippery tennis grips are annoying and sometimes we do whatever it takes to avoid it in order to play our best tennis. When I first moved to Florida, I played a tournament and had trouble holding onto the grip and also my eyes watered every time I tried to serve into the sun. I have worn a glove and worn sunglasses ever since. As far as the glove is concerned, I had a tennis shop in DC for 22 years and had seen every glove ever manufactured and found the best glove is a high quality cabretta leather, golf glove. If you make sure your hand is clean before you put it on, no sunscreen or moisturizer, the glove will last quite a while. It works the best when damp or wet and it only takes a few strokes to get totally used to it. It gives you so much more confidence when you put it on after having had your grip slip a time or two. Fortunately for me, I’ve found a golf shop that has a great glove that normally retails for $17, that they sell for $5, so I stock up every time I go by the store. There are a few sticky cloths on the market that really work. The same outfit that makes the Louisville Slugger baseball bat makes an excellent tennis glove. Here in South Carolina where the heat index is usually over 100 in the summer, we have to know all the tricks. I use a little hand towel attached by a large safety pin to the back waist band of my tennis shorts. I can quickly change the towel during the match if necessary. I have tried all of the other suggestions and found this one works the best for me. It’s always very humid here in NC , so for my grip I use a rosin bag and or sawdust as I’ve seen baseball players and tennis players use, works really well. My real problem is condensation on my glasses. I’m still searching for a solution??? Google, “Condensation on SCUBA masks. Several great ideas there, including the most useful… spit. Spit on the glasses, spread with your fingers and then use a clean cloth to wipe the extra off. Yes, it’s gross but it works GREAT. My club has giant coolers of ice water between the courts. I rinse my hand at changeover, towel dry it. Also, often tuck a small fingertip towel in my waistband.